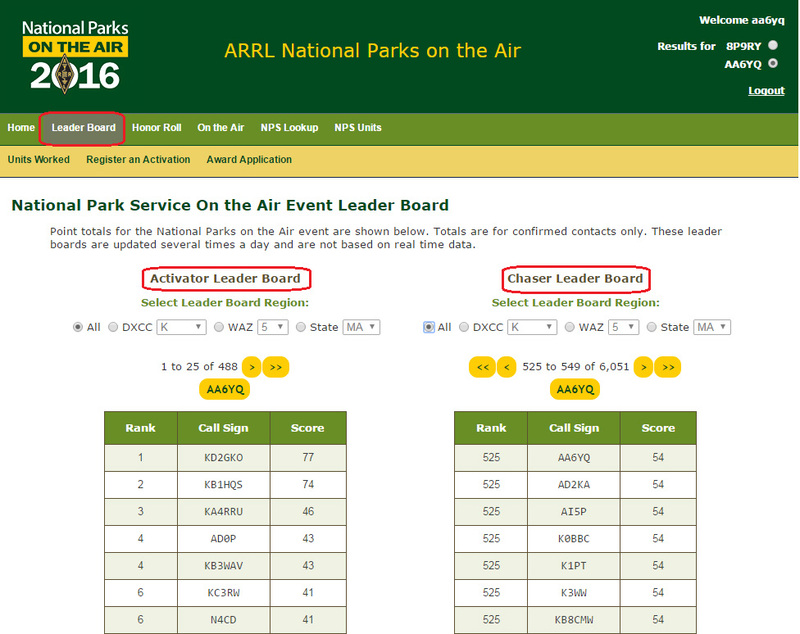 View Your National Parks On The Air "Units Worked"
The yellow <<, <, >, and >> buttons provide navigation within the callsigns selected by the Select Leader Board Region mechanism. Clicking the yellow button bearing your callsign will make your Leader Board entry visible (if one exists). The Leader Board is updated daily with confirmations of QSOs submitted to LoTW. If your callsign does not yet appear at the top of the Activator or Chaser Leader Boards, you don't yet have any confirmed QSOs as an Activator or as a Chaser respectively. Note that a Park activation is not considered valid until at least 10 QSOs have been made. An activation must be registered. When submitting QSOs made from a location within one or more National Parks, an Activator should use a Station Location whose Park selector species the appropriate Park or combination of Parks, as described here. A Chaser need only submit QSOs with Activators in the usual manner. 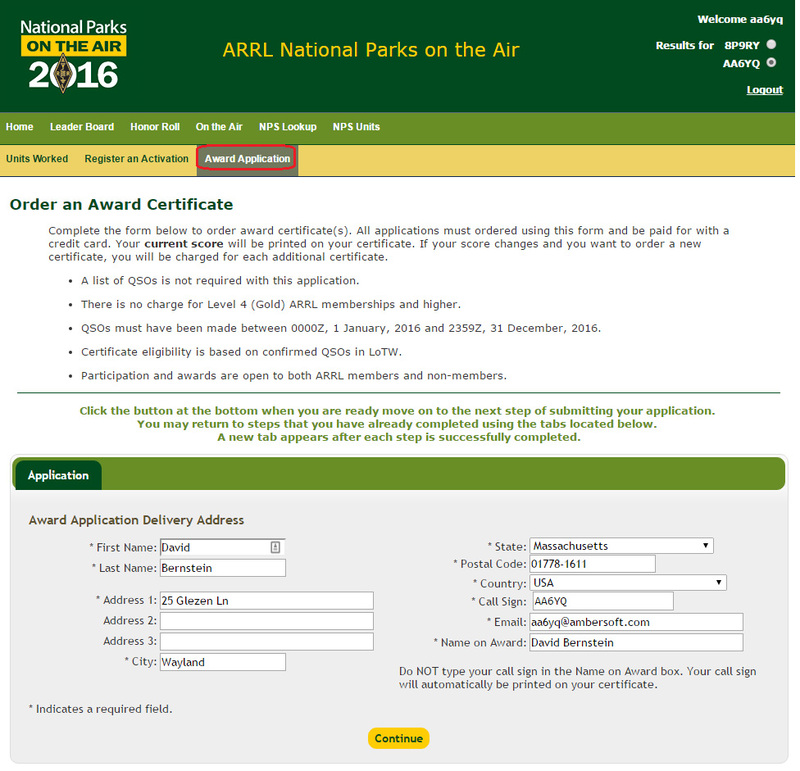 A submitted QSO does not specify a National Park; credit for a Park is granted when a QSO with an Activator of that Park is confirmed via LoTW, based on the Park or combination of Parks specified in the Station Location that the Activator used to submit his or her QSOs to LoTW. 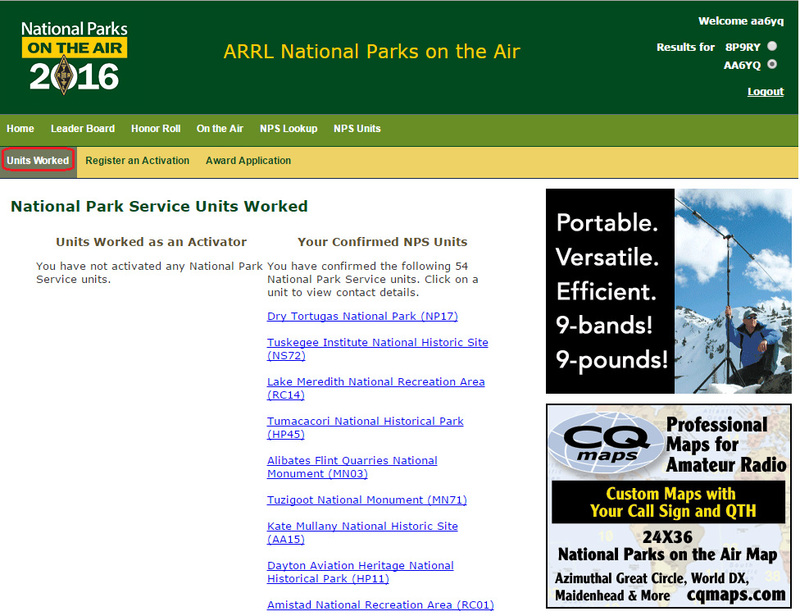 Viewing Your National Parks On The Air "Units Worked"
Clicking on a Unit will display the callsign of the station you worked and the date and time at which you worked it. Note that after submitting an application, you cannot subsequently modify that application. You will receive a certificate printed with your current score. If your score changes, obtaining a new certificate will require making and paying for a new application. To configure LoTW for use with the NPOTA, see this topic.